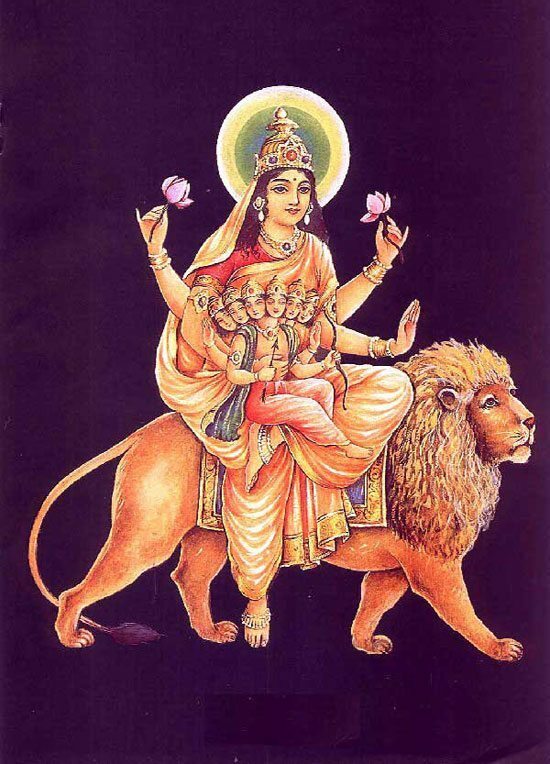 The 5th day of Navratri is dedicated to Goddess Skandamata, the 5th manifestation of Goddess Durga and the mother of Lord Kartikeya, who was chosen by the devatas as their commander in chief in the war against the demons. The image of Devi Skandamata portrays Her holding Lord Skanda in his infant form and a lotus in her right hand. She has four arms, three eyes and a bright complexion. She is also called as Padamasani since She is often depicted seated on a lotus flower in a her idol. She is also worshiped in the form of Parvati, Maheshwari or Mata Gauri. The left arm of the goddess is in a pose to grant boons with grace to her devotees. The legend says that Tarkasur, a great demon, once pleased Lord Brahma with his great devotion and extremely tough penance. He asked Lord Brahma to shower His blessings and make him immortal. Lord Brahma denied him this blessing, saying none can escape death. Tarkasur acted smart and asked for the death by the son of Lord Shiva, since he thought Lord Shiva would never get married. Tarkasur started tormenting the people on the earth. Fearing his strength would cause destructions, the devatas requested Lord Shiva to get married. He agreed and married Goddess Parvati. Their child, Lord Kartikeya/ Skand Kumar, demolished Tarkasur. Devi Skandmata is a symbol of the mother-son relationship. By worshipping Her, you get immense love and affection from her and gets all his desires fulfilled. You may attain supreme joy even in this very mortal world. Her worship automatically includes the worship of Lord Kartikeya (in his child form).